Beautiful vistas and a large selection of game to hunt await the hunter visiting New Zealand. Whether you are a seasoned international hunter or just looking for your first international hunting experience, this South Pacific nation is an ideal destination. A hunt in New Zealand is easy to plan, and it is a safe and welcoming country. Because it is stable and friendly, New Zealand is also a perfect place to include your spouse or family in your adventure. New Zealand offers very diverse terrain that accommodates the desires or physical limitations of all hunters. Hunts can be conducted from the comfort of a five-star lodge with a swimming pool and spa, or from a tented spike camp in the wilderness. The easily accessible lush and grassy lowlands are home to estate hunts which can be accessed via trucks or ATVs. This is often a good option if a companion chooses to stay in the lodge and enjoy the amenities or do some touring. Hunters may also choose remote wilderness hunts in the high alpine ruggedness of the Southern Alps, which are accessed mainly by hiking or helicopter. These are more physical hunts with thick brush and steeper terrain. You can also choose a combination of both. A large selection of game awaits the hunter visiting New Zealand. The majestic red stag is always a favorite for hunters and usually the focus of the hunt. The Himalayan tahr is another of the pinnacle species in New Zealand and can be very challenging to hunt in the steep, rugged terrain where they live. Other species include the handsome fallow deer, chamois, and many other varieties of deer, goats, sheep, and even water buffalo. Again, this selection offers choices to fit every hunter’s tastes and capabilities. All of New Zealand is picturesque, with many locations combining coastal beaches transitioning up to majestic rocky peaks, making this a photographer’s dream. Touring is easily incorporated with a hunt and can include historic sites, glacier hikes, scenic train rides, paragliding, hiking, and helicopter scenic trips. New Zealand makes for a complete hunting vacation adventure that will be sure to please all tastes. Flights are readily available into New Zealand from most countries. Entry into the country is easy and the authorities are friendly and make the process very comfortable. Visitors from a long list of visa waiver countries don’t need to apply in advance for a visa for a stay of three months or less in New Zealand—a visa will be issued on arrival. Check the list of visa waiver countries at https://www.immigration.govt.nz/new-zealand-visas. At least one month before you leave, apply for a temporary firearms license from the New Zealand Police. This is a simple process that can be done online. Your outfitter should assist you with this and provide any pertinent information, and you can also find information here. The other option, if you’d rather avoid this process, is to rent a gun from your outfitter, but check with your outfitter to make sure they have guns available. After clearing immigration you’ll pick up your baggage from the carousel. If you have brought your own firearm, you must declare it to Customs, who will refer you to the New Zealand police. They will check your passport and other paperwork, collect the $25 license application fee (you will have to change currency in the arrivals area since this fee must be paid in New Zealand currency), and issue your firearms permit and import license. Be sure your hunting boots are clean; as an agricultural island nation New Zealand is extremely careful not to allow the import of foreign soils or nematodes. The most sought-after big-game species in New Zealand are red stag, fallow deer, Himalayan tahr, and Alpine chamois, but there are many other huntable species on the North and South Islands including Arapawa sheep and several types of deer. All of these species are available in both free-range situations as well as behind high fences, so be sure to find out from your outfitter what type of hunt is on offer. Because all of New Zealand’s big-game species were introduced at one time, they are considered pests in many areas and therefore some methods of hunting that are not legal in other areas are accepted here. That sometimes include hunting from helicopters, which is not considered fair chase by most hunters. However, because of the steep mountains, many outfitters allow clients the option of being dropped off on a mountaintop by helicopter and continuing the hunt on foot; this is a widely accepted practice in some areas of the South Island. In other areas, however, hunts are conducted entirely on foot. 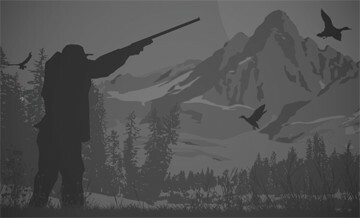 Hunters pursuing the mountain game species should be aware that the terrain is extremely rugged, steep, and challenging. Once your hunt is completed your trophies are usually transported to a local taxidermist to prepare them for export. In some cases, if time permits, you may take your trophies home with you but in most cases they will be shipped to you for import into your country for delivery to your taxidermist of choice. Trophies may also be mounted by one of New Zealand’s expert taxidermists and then shipped to you. 'Majestic' - 'Noble' - 'Regal' - The Red Stag needs no introduction. We offer genuine free range - wilderness red stag hunts. Genuine free range red stag hunting is some of the most exciting and challenging hunting you will ever experience. For the 'True hunter' it is a 'must do'. Luxury cabin accommodation - access by Land Rover. Exclusive private wilderness country. Our guarantee - Genuine Free Range Wilderness Red Stag Hunt ! No high fences - No farm bred animals. We hunt genuine wild populations only. Hunt classic New Zealand's trophies in the lush bush clad mountains of the North Island with bow, rifle or muzzle loader. Please plan at least 1 day per each specie. We deliver New Zealand's finest estate hunting experience. Family-owned and operating New Zealand's largest independently-audited, NZAGE-certified game estate, we provide hunters with greater area, trophy choice and fair-chase principles than any other New Zealand property. This entry-level 5-day hunt is for a Red Stag up to 325 inches - a truly classic Red Stag trophy. Our Red Deer herd features stags from 300 inches to 500-plus inches. 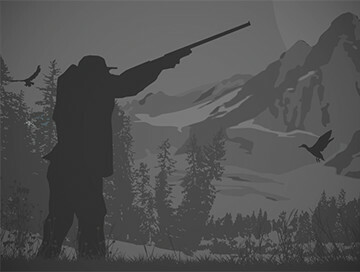 All animals are fair game to any hunter and hunts can be upgraded at any time up to and during the hunt itself. This all-inclusive hunt is based from our luxury hunters' lodge. Located a short drive from the hunting estate, the lodge is the perfect sanctuary for the discerning hunter. We also offer a back-country cabin option which saves the hunter $500 over the lodge. On the estate you can hunt Red Stag, Fallow Buck, Arapawa Ram, Pacific Goat, Wild Boar and Small Game. Tahr, Chamois and Elk are all available within a short drive or helicopter flight. Note: Genuine Free-range Red Stags in New Zealand rarely make 300 inches. No genuine free-range outfitter will offer any score guarantee on their stags. Treat any 'free-range' red stag hunt promising an animal over 300" with caution - ihere is a high chance the stag has been illegally released. The only way to guarantee a fair-chase hunt for stags in the 300"+ range is to hunt on an New Zealand Association of Game Estates (NZAGE) certified estate.